Ideal World vs. Real World: it's a struggle I face daily professionally as an Occupational Therapist working with families and personally as a mama of babies and toddlers. Ideal world parenting ideas are those based on my textbook professional knowledge or things I thought before I had kids. Real world parenting ideas are based on the insanity, exhaustion and logistical realities of having a newborn and trying to keep it together as a functional adult, surviving a fussy baby or one who is allergic to sleep, having multiples, having a baby and toddler (or three kids in three years like this one crazy OT blogger mom I know...ahem...me). And I know I'm not alone in this struggle. Ideal World: The only Baby Holding Device you put your new little one in is a car seat for transportation in the car (preferably not an infant car seat carrier). No cute, cuddly seats, swings, rockers, loungers, nappers...all the stuff that people tell you you need for a new baby (but very few people will tell you the truth that often you don't). In an ideal world your kiddo would have the safest sleep environment possible and awake time with full freedom of movement and sensation for healthy, natural development to unfold. Your Real World Reaction: Lady, are you craaaazy? My arms will fall off if I have to rock this baby for one more second. Also, word on the street is that babies won't sleep flat when they're young and that a Rock 'n Play is the key to my survival and sanity those first few months. And is it even safe to put a newborn in a convertible car seat? While it is possible to raise a baby without any Baby Holding Devices other than a car seat for transportation in the car, I totally get it that this isn't realistic, convenient or desirable for many families. My Real World Solution: I recommend that parents use baby gear in moderation and with high levels of awareness of baby's positioning/posture. But what does that mean?! I talk a lot about using gear in moderation when I talk about my "Rule of 2 and 15," But let's look at that other part of my Real World Solution - your baby's positioning / posture. I'm sure you've heard of the "fetal position" which is a fancy way of saying "curled in a ball and squished into wonky positions in tight quarters." Then baby enters the world through labor and delivery, which can result in minor muscle or skeletal trauma, resulting in more wonky or asymmetric body positions. For these reasons and more, infants VERY frequently arrive into the world with some degree (often very subtle) of asymmetric body position, which means their left side and right sides aren't identical. Some research indicates that over 70% of newborns have some degree of neck or head asymmetry. I often refer to these asymmetric positions as a baby's "preferred position" or "womb position." Great news...given adequate opportunities for active movement and interaction with their surroundings, most babies will stretch and strengthen out of these asymmetries. Some babies will have more significant or persistent asymmetries like Torticollis of the neck but short-term intervention (typically physical or occupational therapy) can really help to stretch tight muscles and strengthen others, usually with no long-term issues for baby. Bad news...the more time a baby spends in Baby Holding Devices, the less time they have to stretch and strengthen out of these very common, subtle asymmetries. More bad news...the semi-reclined position of Baby Holding Devices allows gravity to pull baby into his "preferred position" and supports baby comfortably there for extended periods of time. So, two mechanisms are at play with Baby Holding Devices: reduced time to naturally stretch and strengthen out of asymmetries AND more time in asymmetric postures. These two factors can contribute to more significant, prolonged postural asymmetries that can have long-term effects on motor development, sensory development and cognitive development. And that's really bad news! Looking straight at your baby's front, imagine a line running from the top of baby's head to the middle of her diaper. You want to help baby maintain a straight neck and spine at this midline or middle of her body. Let's take a look at this sweet girl lounging happily. The imaginary line from her head to her diaper resembles a backwards letter C. Her head and hips are shifted to her right (toward the left side of her lounger), creating asymmetry of the neck and torso. Without physically evaluating her I can't be sure if this is a "preferred position" for her (i.e. if she already has underlying muscular or skeletal asymmetries) but too much time in this position will likely lead to shortened muscles on the right side of her body (your left when you're looking at her), which can then make it harder for her to use her right hand, to lift her head in Tummy Time, to turn to see objects on her right side, to turn toward sounds or touch sensations on her right side, to roll, to use both arms equally to assume the hands and knees position for crawling, to sit upright. You can start to see how everything is related, right? It can be really tough to control how your baby positions his head all night long while still following SIDS precautions (flat, firm sleeping surface with no pillows or positioners). But during daytime hours, you have much more frequent opportunities to notice and change baby's head position. In baby gear, you want to encourage looking left, looking right and holding head in the middle or midline of the body. Let's look at this little baby burrito. He is perfectly demonstrating how a head tilt from asymmetrical neck positioning can contribute to a flat spot on the head (learn why head shape matters). His head is tilted to his right (the left side of his bouncy seat) and rotated to his left. This tilt and rotate position is VERY common with Torticollis (one-sided neck tightness). Again, without getting my hands on him I can't be sure if this is a "preferred position" for him or if he has Torticollis, but you can see how too much time in this position could easily lead to neck tightening and flattening on the back left side of his head, which is resting against the bouncy chair. Manufacturers of baby wraps, slings and soft-structured carriers like the Boba or Ergo do a great job of conveying the importance of keeping baby's airway open when worn. But the makers of Baby Holding Devices like bouncy seats, car seat carriers and infant swings don't seem to be as vocal about this message. The risk of a baby's head falling toward his chest or shoulder in a way that compromises his airway is one of the reasons why the American Academy of Pediatrics SIDS safety guidelines warn against babies sleeping in baby gear. Yep, you read that right - it's not safe for babies to sleep semi-reclined in baby gear (yes, that includes the Rock 'n Play). Sleeping babies should be removed from baby gear as soon as is practical and placed on a flat, firm mattress (sorry, the Dock-A-Tot doesn't count either) without bumpers, bedding, stuffed toys, crib bumpers, etc. If your little one's positioning looks a little like this snoozing dude when baby is awake - slumped over and in need of propping, the incline of that piece of gear is TOO steep for your baby's current neck strength and you should refrain from using that device at this time. When you put your baby in a Baby Holding Device, snap a quick photo with your phone (as if you need another reason to take a picture of your cutie!). Every few days, scroll through the photos to look at your baby's position. This will help you notice any preferred positions she's assuming across multiple pieces of baby gear so that you can proactively position her in different positions. Use rolled hand towels or receiving blankets alongside baby's body to help support her shoulders directly in line with her hips. Encourage alternating head position by moving baby gear around the room. If your infant swing is positioned so that the family dining table is on the left, your baby will typically look left each night while the family eats dinner. A simple change of the swing's position every few days will encourage baby to actively turn his head each direction. *NOTE: Do not add any items for positioning your baby in his car seat during travel in a car, including the infant head rests marketed for car seats. These are NOT safe for use in a moving vehicle - read this post to learn why aftermarket products like this aren't safe in car seats. Instead, if you must leave your baby in the car seat carrier when you arrive at your destination, add positioners then to achieve healthy positioning when not in the car. Be sure to remove all positioners when you place baby back in the car for travel. Yes, even if she's asleep. "I'd like him to spend an hour or less in baby gear each day since he's in the car seat for an hour a day getting to and from daycare." "He likes to fall asleep in the swing. Please move him to the Pack 'n Play if he does." "I printed off a picture of the way she often sits in her bouncy seat and swing and a picture of how we use rolled blankets to help her sit more straight. Please help her avoid that crooked position." If you notice significant asymmetries or preferred positions that aren't getting better, if your baby doesn't appear able to turn her head in each direction or if your little one is developing a flat spot, seek the help of a professional. Discuss your concerns with your child's primary care provider. Bring the photos you've taken to show how frequently you're seeing positional preferences. "Let's wait and see," is a frequent, but NOT RESEARCH-BASED RESPONSE. 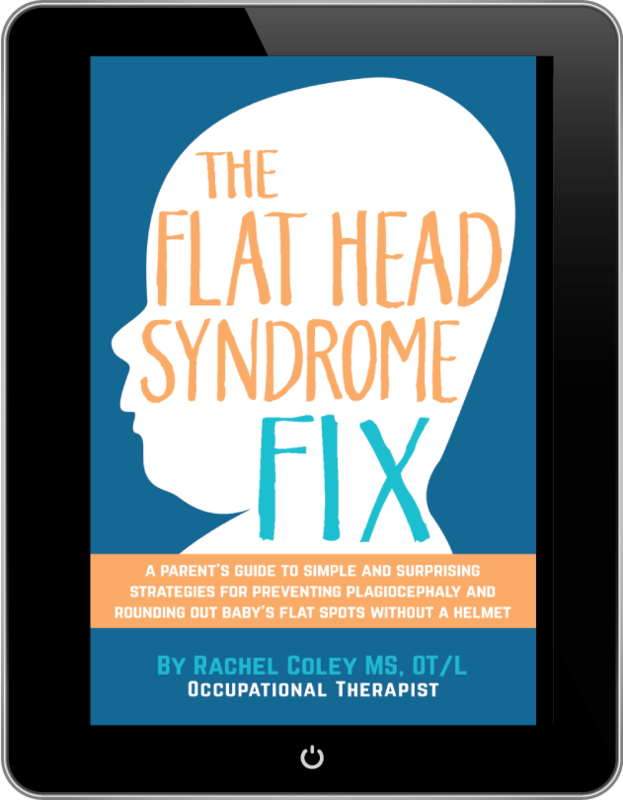 (This approach is one of 4 Myths about Flat Head Syndrome I hope to bust for every new parent) The American Academy of Pediatrics and other professional organizations have clinical guidelines for physicians that highlight the importance of parent education and early referral for intervention to address Torticollis and Plagiocephaly. If your child's physician is unable or unwilling to walk you through repositioning strategies and/or stretching exercises, ask for a referral to a pediatric physical or occupational therapist with experience treating infants. You are your child's best advocate!